Cut each eggplant lengthwise into very thin, even, 1/4-inch slices. Sprinkle each slice with salt and place it in a colander to drain for 20 minutes. (This will draw out moisture from the eggplant and also make it less bitter.) After 20 minutes, rinse each slice briefly and press with a paper towel to remove all the moisture. Spread a thin layer of the sauce in the bottom of a 9X11-inch pan (spraying the pan first with non-stick spray will help prevent sticking). Place a layer of eggplant over the sauce, covering the entire bottom of the pan. Spread half of the tofu mixture on the eggplant. Cover with another layer of eggplant and then spread the remaining tofu mixture over it. Top with a final layer of eggplant, and pour the remaining sauce over this. Cover with foil and bake for 20 minutes; remove the foil and bake for 10-20 more minutes, until eggplant is tender. Remove from the oven and allow to cool for 10 minutes before serving. 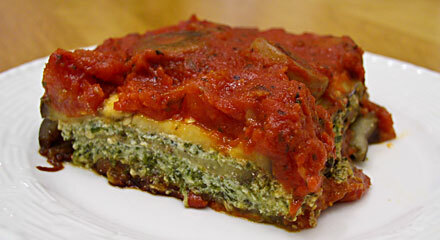 NOTE: The thinner your eggplant slices, the less time your lasagna will need to bake. For perfect, thin eggplant slices, use a mandolin or other slicer. If you cannot get your eggplant 1/4-inch thick or less, consider pre-cooking it in a non-stick skillet or on a baking sheet in the oven until lightly browned.